Primary ciliary dyskinesia (PCD) is underdiagnosed and requires complex testing at specialist diagnostic centres. Measurement of nasal nitric oxide (nNO) has good sensitivity and specificity screening for PCD, but is currently usually measured at PCD centres rather than prior to referral. Proposals to include NO testing for asthma diagnoses could widen access to PCD screening if nasal mode analysers are available. Data from 282 consecutive referrals to our PCD diagnostic centre (31 PCD positive) were used to model predictive values for nNO testing with varying pretest probability and showed that predictive values were good in the referral population, but extending screening to more general populations would result in excessive false positives that may overwhelm diagnostic services. Although nNO remains a useful test, a ‘normal’ result with classical clinical history should still be considered for further testing. Proposed asthma diagnosis guidelines from the UK National Institute for Health and Care Excellence include the expansion of exhaled nitric oxide (NO) from a research tool into routine care.1 This could lead to improved availability of nasal NO (nNO) screening for primary ciliary dyskinesia (PCD). 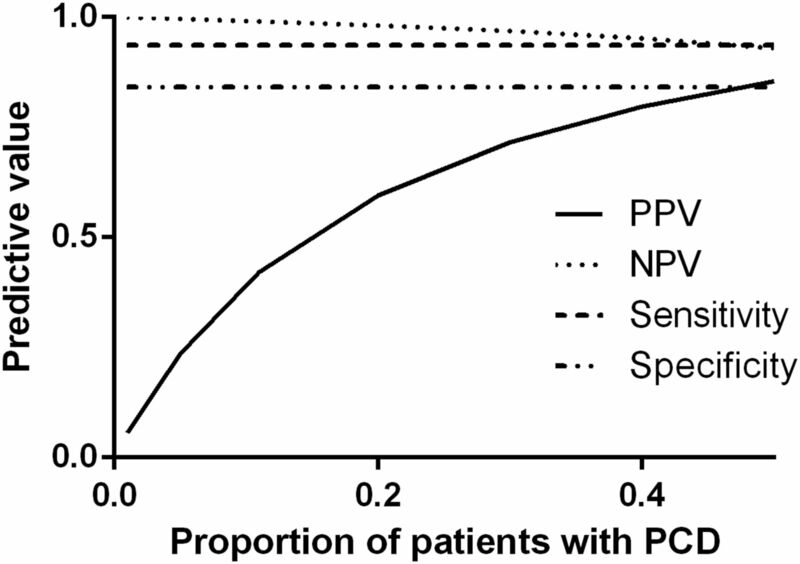 Relationship between PPV and NPV and the pretest probability of PCD (proportion of patients with PCD in the tested population). Sensitivity and specificity shown to illustrate that these are test specific and do not vary with disease prevalence. NPV, negative predictive value; PCD, primary ciliary dyskinesia; PPV, positive predictive value. These results are significant for several reasons. First, a NPV of 99.1% confirms that nNO >77 nL/min is excellent for excluding PCD, although cases of PCD with normal nNO are well documented.2 Second, although a PPV of 42% makes nNO a poor diagnostic test in isolation, use prior to referral could reduce referrals and patient burden/healthcare costs associated with travel to a distant centre for complex diagnostics; indeed, 211 of our 282 patients would have had PCD correctly ‘excluded’ by nNO screening. Patients with a particularly strong history would warrant formal testing even with nNO >77 nL/min. Importantly, if nNO is used as a screening test in populations without classical symptoms of PCD, the number of false-positive cases will overwhelm diagnostic services. PCD is underdiagnosed but increasing awareness and structured diagnostic referral pathways are helping tackle this.3 Wider nNO use would rely on screening only those with classical symptoms of PCD and adequate competency-based training of those taking/interpreting nNO readings. Our measurements used a ‘gold standard’ breath-hold method with chemiluminescence analyser. Alternative breathing manoeuvres reduce discriminatory value2 and portable machines without a ‘real-time’ nNO trace risk not taking plateau nNO readings. As NO analysers become more widespread, the opportunity for nNO screening at centres without PCD diagnostics is potentially useful if used in correctly selected patients. Excellence NI for H and C. Asthma: diagnosis and monitoring of asthma in adults, children and young people. 2015. https://www.nice.org.uk/guidance/dg12/resources/asthma-diagnosis-and-monitoring-draft-nice-guideline2 (accessed 25 Feb2015).
. Accuracy of diagnostic testing in primary ciliary dyskinesia. Eur Respir J 2016;47:83748.
. Incidence of primary ciliary dyskinesia in children with recurrent respiratory diseases. Ann Otol Rhinol Laryngol 1997;106:854–8.
. Primary ciliary dyskinesia. Eur Respir Mon 2011;54:201–7. Contributors AH and KG conducted patient testing, LB collated and analysed data, SAC analysed data and drafted the manuscript with JSL. Ethics approval Southampton and South West Hampshire Research Ethics.